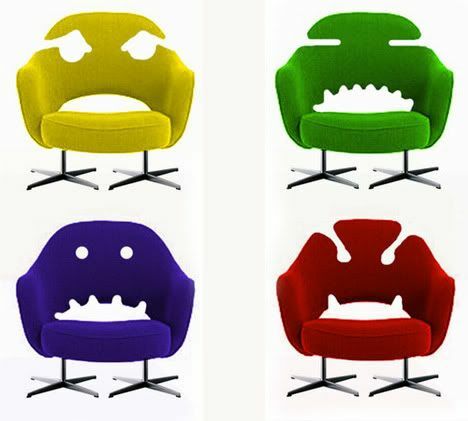 Quirky Jessi: Monster chairs - I hope they don't eat me! Monster chairs - I hope they don't eat me! Ahhhh! Oh wait, they're just chairs. I'm not sure where these chairs would really be "appropriate." They're funky, but can't go in a kids room because small ones would end up getting stuck in them. Maybe in an abstract art gallery? Or your lawn to scare off any pesky kids? I guess the only questions remains... how comfortable would they be? None the less they are pretty cool chairs. Like you said they would be great fr the kids room.